Image caption Majid Jamali Fashi faces the death penalty if found guilty of "war against God"
An Iranian man has gone on trial, charged with killing one of the country's nuclear scientists and having links to Israel's Mossad spy agency. State media said Majid Jamali Fashi had confessed to the murder of Massoud Ali Mohammadi, a physics professor at Tehran University, on 12 January 2010. Prosecutors said Mr Fashi had killed Mohammadi by detonating a bomb planted on a motorcycle left outside his home. Iran has accused Israel and the US of trying to harm its nuclear programme. The two countries believe Iran is trying to acquire the technology to build nuclear weapons, something Tehran vigorously denies. On Tuesday, Iranian state television released details of the prosecutor's charges against Mr Fashi. 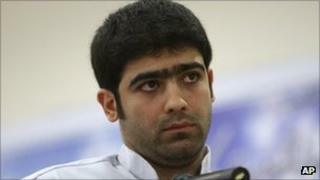 He was accused of receiving training from Mossad and being paid $120,000 (£72,000) to kill Mr Mohammadi, it reported. The conservative Mehr news agency also said Mr Fashi was charged with "war against God", which carries the death penalty. In his confession, Mr Fashi allegedly said he was ordered by Mossad to carry out five other killings, but did not go through with them. Several other Iranian scientists have been killed in recent months. Daryoush Rezaei, also a physicist at a Tehran University, was shot dead outside his home in Tehran in July, state media said. Majid Shahriari, a member of the nuclear engineering department of Shahid Beheshti University in Tehran, was killed last November, while Fereydoon Abbasi was injured in an attack on the same day. Reports said motorcyclists drove alongside the scientists' cars, attached magnetised bombs to the side of the vehicles, and then drove away. Iran has blamed the US and Israel for the attacks, saying they were an attempt to slow its acquisition of nuclear technology.